What are the Different Types of Windows Shades? It is easy to confuse the different styles of window coverings. Shades are simply solid lengths of fabric you can pull up and down over windows. They can operate on a cord or lifting mechanism. These are the simplest type of window shade and often the most affordable. They fit inside the window frame and function on a pulley-type system. You can get roller shades in a huge selection of fabrics and accessorizing them with trim, tassels, and painted designs. 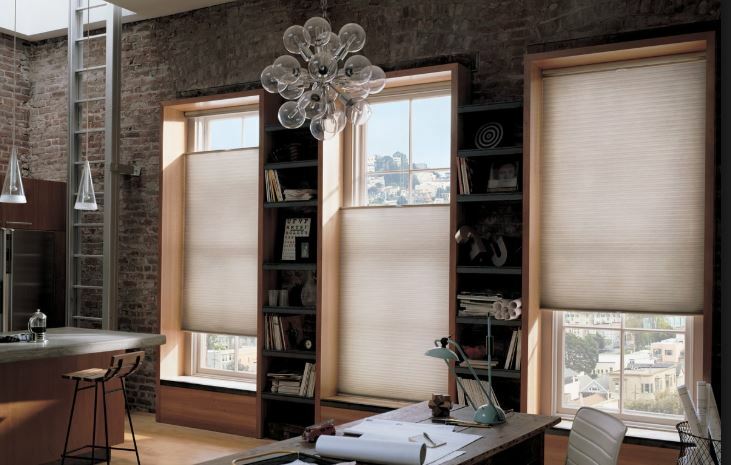 These window coverings are roller shades made of fabric specifically designed to reduce glare and solar heat gains. They give you privacy in the daytime, while also allowing homeowners to see outside. These consist of a solid panel of fabric featuring horizontal folds. The panel lays flat against the window when down but fold up when the panel raises. Many homeowners choose this window covering because it combines the aesthetic of a fabric drape with the functionality of a shade. These are also known as stagecoach-style, which pretty much sums out how they look. Fabric hangs flat from a rod and instead of cords and pulleys you lift the shades by hand and tie them with attached ribbons creating a graceful drape along the bottom. But do adjust the shade homeowners have to untie ribbons and hand roll the shades every time. With cords running through rings on the back of the shade these fabric window shades gather into poufy cascades. To create the balloon affect these shades are often made of sheer fabrics. From far away these look similar to blinds but are actually made from a pleated sheet of fabric. They pull up and sit flat against the top of the window to hide from sight, but pull down in a solid panel. Also known as honeycomb shades can do it all. They allow for light control, privacy, and insulation. In fact, insulation is the feature homeowners are most drawn to. These windows shades are designed with long, open channels that trap air at the window. This helps insulate the room from heat transfer. Instead of fabric, bamboo shades are made up of woven lengths of bamboo. The lengths of wood can be ultra-thin, and look like fabric. Or they can have a little more width. Homeowners like to add these blinds because of the natural texture. If you are looking for a variety of windows shades in Plantation, FL contact us at Open House Interiors. You can call (954) 533-7445 or visit our showroom at 4312 North Federal Hwy., Fort Lauderdale, FL 33308. ← What are the Advantages of Faux Wood Window Shutters?